If you are someone, who love to gamble on video machines and if you are tired to throw your money in just a few minute, then the foremost thing that you should do while playing video poker is to learn the rules of this game. The machines of video poker began to emerge in the casinos back in mid 1980s. From then video poker are gained widespread popularity across the globe. You might have played the game of 5-card draw game of poker. The rules of video poker are very similar to this game. There are a few limitations though, as you are not playing against anybody in reality. You just try to get a high hand. Prior to the beginning of video poker game, you will have to bet. For doing this you just need to put in your money in the machine and then you will have to select the number of credits that you wish to bet. The best method of playing is to bet five credits. You can check out the payout of the games by hitting the 'Pays' button. The payouts are usually similar regardless of the amount of coin that you bet. However, this is not the case for royal flush. 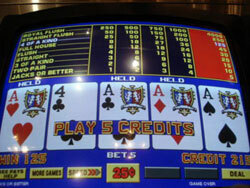 Royal flush pays 1250 credits if you bet five, although, on the contrary, it pays you 4000. This is the case with almost each video poker machine. This is also a reason behind the low house edge in this game. Therefore, it is suggested that you should bet five credits all the time. To begin the game players are dealt with 5 cards. A player can select any, every, or none of the cards to keep. Diverse cards from a virtual deck are used to replace every rejected card. A hand of five card poker is then weighed against the payout table and depending on the hand payment is made to the player. The kind of winning hands in poker, as well as the amount, which the machines payout varies from one machine to the other. For instance, the 'Deuces Wild' edition of video poker payout for a hand with five of a kind whereas, the edition of 'Jacks or Better' of video poker machines does not pay on such a hand. You can go through the payouts and the winning hand that are listed on a machine, or else you can access the information by pressing the 'Pays' button. A player can then place another bet or can opt to end the game.